The Historic Scientific Instrument Collection at The Rockefeller University was created by Professor Merrill W. Chase during his distinguished career as an immunologist from 1932 until his death in 2004. One by one, he acquired from his Rockefeller colleagues instruments of historic interest when they were no longer needed in the laboratory. He documented each instrument so that its place in the history of The Rockefeller Institute and later the University would not be forgotten. He enjoyed the intellectual challenge but did not publicize it. Nor did he ever ask the institute to provide facilities or a budget for the collection. Nevertheless, it was by his efforts that the collection has survived and grown, even though until 1996 it was crowded into odd corners with no real home. It was indeed a well-kept secret, and even to this day there are very few at the university who have heard much about it. 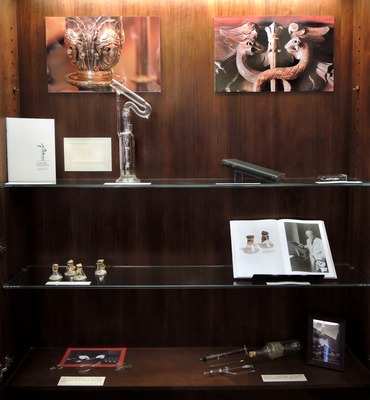 When in 1997 President Torsten Wiesel gave a formal recognition to a collection, it had 262 instruments or sets of instruments, all documented by Merrill Chase. Today, it has 358 and grows by a few every year.